In the preceding Spring and Autumn Period division of the Eastern Zhou dynasty, China was a feudal society, where people 'belonged' to their lord. Small walled cities had emerged which were largely independent. By the time of the Warring States small town based fiefdoms (around 170) had merged to form seven large kingdoms: Qi; Chu; Yan; Han; Zhao; Wei and Qin. Although in theory all still acknowledged the Zhou Emperor as their supreme leader it had become an honorary title with no actual power. The period takes its name ‘Warring States’ from the historical work ‘Strategy of the Warring States ➚’ 战国策 which chronicles the incessant warfare between the kingdoms. This was in part fueled by the need for more aggressive measures to stave off attacks from neighboring barbarian tribes. Powerful clans arose in armed opposition to the local ‘king’. There are similarities with Ancient Greece ➚ when Athens; Sparta and other small kingdoms vied for dominance at roughly the same time. Appropriately this was the time that Sun Wu 孙武 or Sun Tzu WG [544 - 496 BCE] wrote the influential ‘Art of War ➚’. This classic covers such topics as strategy; espionage; maneuvers; using terrain; tactics and planning and has been widely read over the ensuing centuries. Phrases such as ‘If you know both yourself and your enemy, you can win many battles without risk’ remain useful idioms even to this day. Sun Bin’s ‘Art of War’ (possibly a descendent) was also written in this period. It described the strategy for the nobility to fight each other in chariots, as well as the use of cavalry, infantry, archers (with crossbows) and other specialized fighting units. The building of larger armies had enabled the gradual conquest of smaller fiefdoms to form the seven large states by 300BCE. The early development of iron working began principally in the state of Qi, together with the mass production of salt. The iron plow; irrigation systems and the use of oxen greatly increased the productivity of land. Perhaps the most significant development was the production of cast iron, that is iron that could be poured into molds to make all sorts of tools and weapons; this predates the West by about 1,100 years who were still using the old 'bloom' furnace process. The Chinese had discovered that phosphate rich material lowered the melting point of iron as well as designing more efficient furnaces. Bronze coins came into circulation to supplement the older form of monetary unit which include the bolt of silk and cowrie shells. 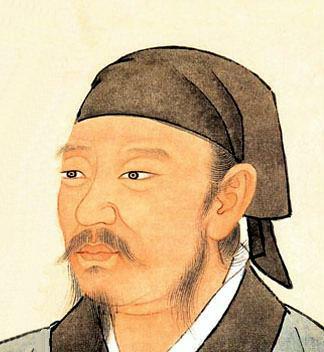 In literature the poet Qu Yuan (340-278BCE) of the Chu kingdom is the most famous for his collection ‘Elegies of Chu’. The ‘Classic of Poetry’ or ‘Book of Odes ➚’ is an anthology of poems from the 10th through to the 7th century BCE. The widely read and used ‘Book of Changes’ Yi Jing is also believed to have been authored at this time as a synthesis of earlier work. 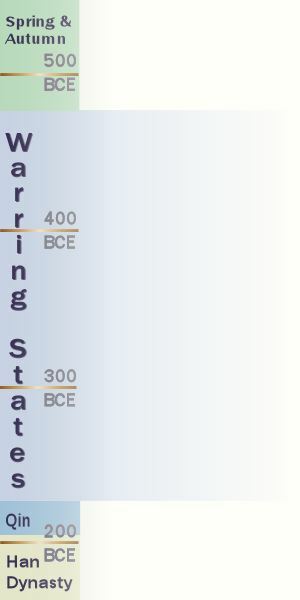 The Warring States Period is known as the time when all the major schools of philosophical thought developed : Mohism ➚; Confucianism; Legalism and Daoism. The ‘Hundred Schools of Philosophers’ (500-200BCE) and the Academy of the Gate of Qi or Jixia Academy ➚ flourished. A budding philosopher would advise the various state governments on the wisest way to rule and avoid conquest. 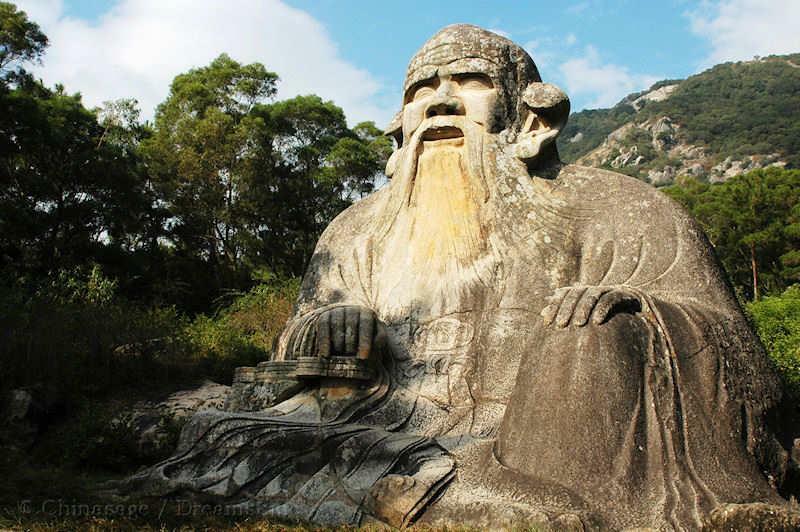 Great thinkers such as Mencius 孟子 Meng Tzu WG; Zhuang Zi 庄子 Chuang Tzu WG; Xun Zi and Han Fei all built on the founding work started by their masters. Just north of Xi'an the Qin kingdom built the Zheng Guo canal from the Jing river to the Luo river to provide irrigation that greatly improved agricultural yields. 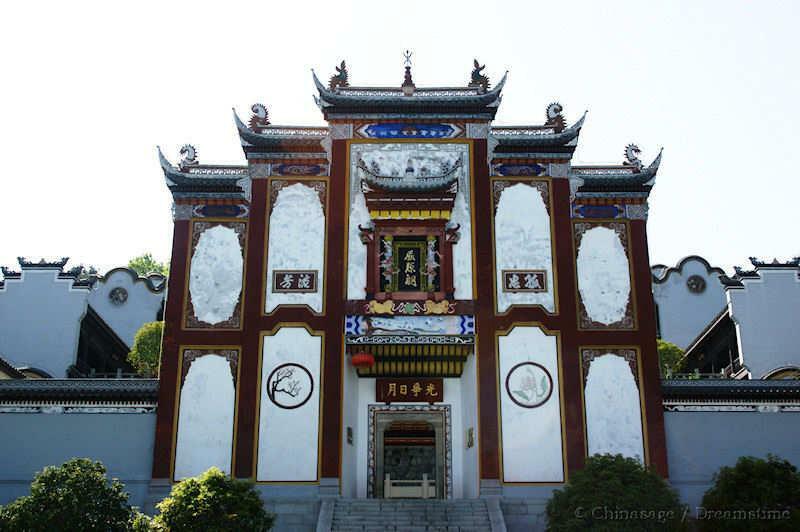 This scheme at the heart of Sichuan around Chengdu was started in 316BCE and continues in operation to this day. The canal engineer Li Bing built the Dujiangyan irrigation system ➚ on the Min river during this period. A carved statue of Li Bing proudly attests to this feat of engineering built over two thousand years ago. For many centuries the statue stood in the waters and the level of the river lapping up against the statue warned of flood or drought conditions. [A Daoist deity Erlang Shen 二郎神 is reputedly his son]. It was during this period that the traditional bamboo writing brush came into use as well as chopsticks. In the end, it was the kingdom of Qin who became an organized military power with ambitions for conquest. As the westernmost kingdom it was the Qin who had the greatest need for an army, it had to defend itself from the raids of nomadic tribes to its West. Its actions were brutal, for example, a captured Zhao army of 400,000 were all slaughtered and the King of Chu was invited as a guest only to be imprisoned for the rest of his life. The Qin quickly engulfed the other six states to form the unified nation of China for the first time. The great historian Sima Qian described the conquest to be like a silkworm devouring a mulberry leaf. Xún zǐ 荀子 c. 312-230BCE was a Chinese Confucian philosopher who lived during the Warring States Period and contributed to one of the Hundred Schools of Thought. Available under a Creative Commons license ➚. Even though the Eastern Zhou dynasty was a period of conflict, it was also a golden age for Chinese thought. All the many contending Chinese schools of philosophy were developed and refined at this time which coincided with the intellectual flowering of ancient Greece. The common factor was that both civilizations had developed to the point of supporting substantial urban populations. Each school of thought had its own scholars producing sets of writings. The schools took their teachings around the many fiefdoms at the time seeking support. Eloquent delivery and criticism of rivals (rhetoric) were just as important as philosophic content. Literate and scholarly courts encouraged competition among followers to secure their adoption. It is likely that many Machiavellian ➚ doctrines, advocated and put in place during this period have gone unrecorded. Although there were certainly several schools, a ‘hundred’ is quite an exaggeration. Confucius was very much at the heart of this movement, traveling from one kingdom to another, he sought to persuade the ruler and his court that Confucian teachings would bring peace and prosperity to the kingdom. Mozi founded the Mohist school of universal love; pacifism and honoring the virtuous. Laozi and his followers developed Daoism. Han Fei pioneered the Legalist doctrine of rule by central diktat, and as such not really a philosophy at all. Legalism was taken up by the Qin kingdom to dramatic effect. Yang Zhu ➚ proclaimed self interest should be the guiding philosophy with indifference to all else. These examples show how the period was characterized by an amazing diversity of outlooks and perspectives. The burning of the books during the Qin dynasty was intended to remove all traces of every school except the Legalists; and so only fragmentary records of the writings of the other schools have survived. Anyone who hid the forbidden writings faced the death penalty and paradoxically this led to some writings surviving because they were carefully concealed and protected but only the Confucian and Daoist philosophies survived the Qin period in a reasonably complete form. The Hundred Schools period came back into popular knowledge when Chairman Mao instigated a similar movement with the phrase 百花齐放，百家争鸣 “let a hundred flowers bloom and a hundred schools of thought contend” in late 1956. The policy was designed to promote the flourishing of literature, arts and sciences. However, Mao was met by a chorus of dissent and quickly discontinued the policy in July 1957. Those opposing his views faced prison where their wayward thoughts could be remolded by a re-education in the ways of the new Communist orthodoxy. 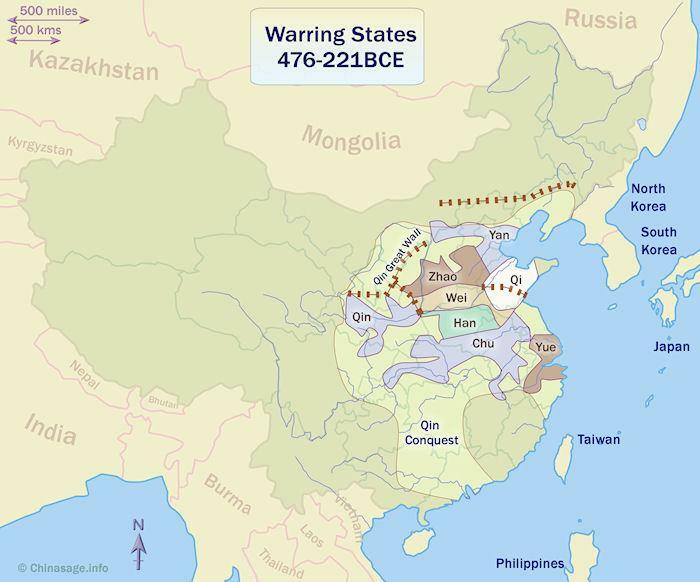 Citation information for this page : Chinasage, 'Warring States Period - the second half of the Eastern Zhou Chinese dynasty 476 - 221 BCE', last updated 7 Dec 2016, Web, http://www.chinasage.info/dynastywarstates.htm.